In a medium bowl, combine the ketchup, honey, sauce from the chipotles, chipotle chiles, garlic, olive oil, Dijon mustard, apple cider vinegar, Worcestershire, Maggi, black pepper and oregano. Mix well. Line a large roasting pan with parchment paper or aluminum foil. Pour some sauce on the bottom of the pan, put in the ribs and pour the remaining sauce on top. Cover with foil, sealing the entire top of the pan, and marinate for 30 minutes up to 24 hours. If marinating more than 30 minutes, keep the ribs refrigerated. When ready to cook the meat, remove it from the refrigerator. Preheat the oven to 350°F. Slip the pan with the ribs into the oven and roast for 1 1/2 hours. Take the ribs from the oven and carefully remove the aluminum foil, taking care not to be burned by the steam. Spoon the thickened sauce from the bottom of the pan on top of the ribs and place them back in the oven to roast another 20 to 30 minutes, or until they are beautifully browned and sticky. Remove from the oven, let rest, then slice into 2- to 3-bone pieces and pile on a platter. Alternatively, after you remove the foil, you can finish off the ribs on the grill at medium heat, for about 15 minutes. Hi Pati, I tried this recipe, great flavour and the right amount of heat! Just one question, when returning ribs to the oven for the last 20-30 mins, do you cover pan with foil or leave it uncovered? Love your show. When you return them to the oven, you don’t need to re-cover them with the foil. And I’m so glad you enjoyed the ribs! I made these yesterday for a family BBQ. They were so easy and delicious. I made the sauce a day in advance and marinaded the ribs for several hours the morning I was serving them. They bake so well and easily and the final 30minutes really guarantees that the ribs caramelize. It was the perfect, no fuss food to have cooking while guests arrive. I served them with Pati’s potato salad with rajas and sesame seeds and it was perfect. We also served the chorizo burgers with avocado crema from her 2nd book and arugula/date/walnut salad and it was a perfect BBQ menu. Oh it sounds like you had an amazing BBQ, Leila. Pati, this recipe is so delicious. I have made it four times. I enjoy watching your show and the lovely stories behind every recipe you make. Never, in my 60 + years, have I finished a bottle of ketchup. I’m on my 3rd bottle this summer! This is FABULOUS. Use it for any meat. I even cooked a fish filet in this sauce. YUM! I have cooked ribs in this one night, and then use the leftover sauce the next night for chicken. I will never buy BBQ sauce again. Thank you Pati! Yay! So thrilled you love the sauce Betty. So happy to hear that Norm and thank you for sharing! I will make the Honey Chipotle Ribs the grilled Romaine salad and also will prepare the Ancho Chile pickles. What else would you recommend for this menu? I thought my first message went earlier..they were so easy to make. I thought i would serve these for the superbowl tonight..Love your show on pbs. Thank you for tuning in Marie! I am so happy you like the ribs! Hello Pati-may I have the recipe for the marinated, candied ancho chilies again, from the Girls Just Want to Have Fun episode? I believe it was white vinegar, water and brown sugar, but I want to be certain; I’m gifting jars of chiles for Christmas, and as an Irishman, I though it best to double-check! My Dear Pati, I’m wishing you & yours a festive Cinco De Mayo! I’m in the middle of making these ribs for the first time for this occasion! The sauce is delicious as I’m sure my ribs will be as well. I don’t have much time so I put them into the pressure cooker, I’m letting them cool down now. When I can open the lid Im going to put them onto a pan then put them into the oven to get them sticky. My company is coming soon but I wanted to take the time to let you know how much I appreciate you, your show & your recipies! I written down both your recipes I going to try it this weekend, sounds delish. Thank you for getting back to me. I hope the rain, didnt ruin you and sons day that i saw Sat. at 5pm. thanks again. So, the technique worked, but I like your preparation better. (Braised?) Be nice to see what a real pitmaster has to say. Incidentally, we had a lot of ribs left over, so I thought to make tacos. Came across your picadillo recipe. Made that with rib meat picked from the ribs. The result was too soupy for tacos, so we made a big bowl of spaghetti, and covered it with picadillo. Pati, acabo de hacer esta receta. Que delicia! Muchas gracias. Me encanta tu show y tus recetas. Sigue adelante! Y felicidades. Making the honey-chipotle ribs for the second time!!! The sauce is incredible. So, here’s my question: Have you ever put those marinated ribs in a conventional smoker? I think your recipe would drive the low-and-slow BBQ crowd bonkers. And, I bet the smoke would meld well with the chipotle-honey background. Muchos Gracias for sharing your Mexican ribs and sauce recipe with everyone! I made 3 racks for mi esposo’s birthday party this weekend and made extra sauce for everyone to use if they wanted. I did not have any time to marinate them and everyone LOVED them and the sauce, and I told them all about your show and gave them the recipe! thanks to you, the party food, was a huge success! Gracias, Gina! Sounds like it was a great fiesta!! Thank you for sharing the ribs with everyone. The ribs were great and a big hit in my family! I will definitely be making them again. I love your show and will be tuning in for more great recipes! I was wondering if after marinating the ribs for about 30 minutes or so can we put the ribs directly onto the grill without going into the oven at all? By the way, I love your show. Thank you r sharing your amazing culture with all of us. I have a great BBQ Sweet and Sour Chicken recipe if you would like it. I am sure you would put your own Mexican twist on it and make it your own. I you would like the recipe let me know and what email address you would like me to send it to and I would be more than happy to send it to you. Hey Pati. OhMyGoshness. I made these Ribs for my daddy & he was in love. Best food he has ever tasted. Love your show. I can’t wait to try other recipes from you. Que Dios Te Bendiga a Usted y su Familia. Howdy from Spring, Texas! Stumbled across your show on TV today for the first time and loved it! It was a re-run of the one about the honey-chipotle bbq. Don’t eat pork but will try it out with beef ribs or chicken. Realized I have all the stuff nbeeded for mango guacamole so guess what’s on for supper tonight! In the show you had a woman who made “tacos” — rolled up and fried? Any leads on how to get a recipe for them? Thanks! Hi Pati! We love you and your show, my two year old runs around the house saying “Pati is on, Pati is on!” These ribs are awesome, I have entertained with them a few times and all our friends loved them too. I always make double the sauce and freeze it for when we want BBQ chicken. We also love your cookbook and I make things out of it at least three times a week. Chicken a la trash one of my favorites! Thanks Pati. Thank you for writing, Kristin! Please say hi to your 2 year old and thank him on my behalf for watching the show! This sauce is amazing! Absolutely delicious! You could sell this BBQ sauce for ribs and become a millionaire! This was my first time trying one of your recipes and now I am hooked. I can’t decide on what to try next… Maybe the carnitas.. They sound amazing! Thanks for your sharing your talent with us. Haha! Good idea! Yes: carnitas should be next. Hi Pati! I’m so glad I ran across your show a few weeks ago. Imagine a genuine Mexicana on TV preparing authentic Mexican cuisine. I am Mexicano Americano which is why I say this. Your show is so easy and fun to watch and your visits to Mexico and talking to the people is awesome. I even told the guy at the Mexican grocery store about your show. I have tried some of your recipes and they are so good! 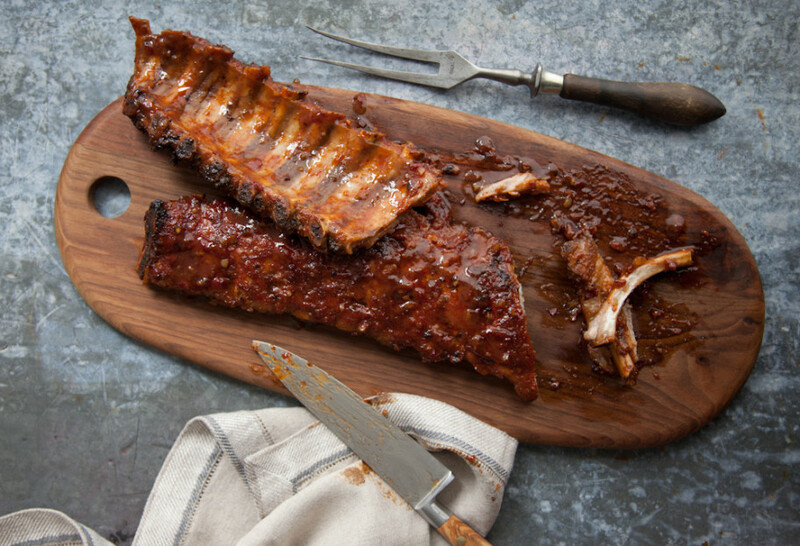 I am going to cook these chipotle ribs for my wife and family on Mother’s Day (USA). Thanks and keep it up! Happy Mother’s Day to your wife, and I am so happy you are making these ribs on this special day! The Chipotle Ribs were soooo good! I doubled the recipe but they didn’t last long. Going to try the remaining sauce with chicken thighs. Thanks Pati for a great recipe! With chicken should be wonderful too, what a great idea! Thank you Sunnie! I have never tried it with chicken: great idea. I mentioned I used Chicken thighs with the skin, there was a lot of fat in the broiler pan so remember to use a deep roasting pan this way it’s easier to remove from the oven without spilling & messing up your oven.